I still remember it today. On a cold November night in 2009 I walked into the Gaja tasting room in Barbaresco to find all of 1989s and 1990s opened. I had been tasting the 1989s and 1990s all week for my article Piedmont’s Glorious 1989 and 1990 Vintages Revisited, which was published in February 2010. Naturally, I was very much looking forward to this tasting. The first thing that hit me was the perfume that wafted throughout the room. Classic Nebbiolo scents of tar, rose petal, leather and exotic spice were everywhere. Then I tasted the wines. They were absolutely breathtaking. Favorites? Nearly impossible to choose from a set of riveting wines that captured the essential qualities of these two historic back-to-back vintages. 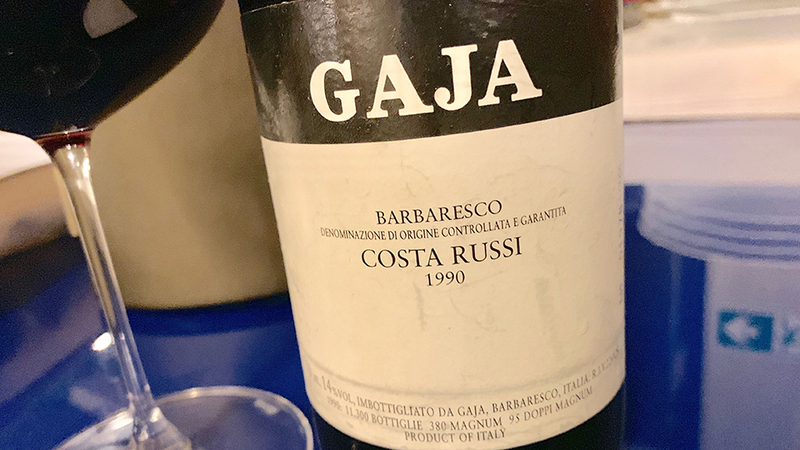 The 1990 Barbaresco Costa Russi brings back a rush of memories from a tasting that feels like it happened just yesterday. Time has been exceedingly kind to the 1990. Soft, pliant fruit and silky tannins speak to the pure sensuality that makes Costa Russi so alluring. Still quite young, the 1990 has enough depth and pedigree to drink well for another 15 years or more. On this night, it is simply breathtaking. 97/Drinking window: 2018-2033.